This year’s NBA Finals showcased a set of elite players all at different stages in their careers. 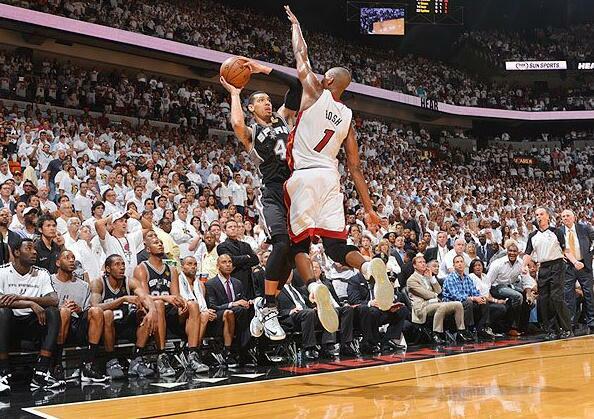 From rising to super to aging stars, the Spurs and Heat combined to have it all. With this variety of players, I am going to discuss the past, present and future of three specific men that all had major impacts on this seven-game battle. Saying “the past” doesn’t mean that this player’s career is winding down and we should begin reflecting on what he has accomplished. I am choosing a player that just scored 23 points in the closeout game and averaged 23.5 points in the final four games, so that clearly doesn’t apply here. I’m bringing up Dwyane Wade‘s past to discuss the fascinating path he has taken in order to become a three-time NBA champion—something that makes him a very significant player and elevates him above many others in the league. When Wade won his first championship in 2006, regardless of whether or not you agreed with the calls being made during that series (keep it together, Jay, keep it together…), that man willed his team to that championship. Yes, they had Shaq. Yes, they had Payton. But when it came to the playoffs, Wade took command for an entire series in a way LeBron hasn’t even come close to doing. Just to remind you exactly what he did to the Mavericks seven years ago, Wade averaged 43.5 minutes, 34.7 points, 7.8 rebounds, 2.7 steals and 16.2 free throws attempted. He averaged 34.7 points for six straight games…in the NBA Finals. Wade found a way to make his first ring not be elusive as it seems to be for so many and to catapult himself up the list of best current players in the game in only his third year of playing NBA ball. Then came the bridge between that first ring and the Big 3. Those four seasons consisted of Wade, Wade, Wade injury, Wade, Wade injury, Wade, and more Wade. Oh, and some Michael Beasley, too. Pat Riley and his Heat front office had built a team that streaked through the playoffs in 2006, only to be too old and lacking of pieces that could contribute for the years down the line. That’s what got them in that horrible NBA rut of no man’s land and irrelevancy. So, after a few years, Riley envisioned the signing of some big-named stars once the summer of 2010 came around. He allowed the man that already earned the league’s respect with his historic Finals’ performance to go through three exits in the first round and a 15-67 season two years after his championship. Wade continued to be the team’s offensive leader, pouring in a league-leading 30.2 ppg during the 2008-09 season. He continued to play at a high level even though he knew his organization was making him play the waiting game until they could bring in some players as good or better than him. Their NBA Finals MVP wasn’t enough. And he probably wasn’t, to be honest. That run in 2006 was as magical as people say the Mavs’ run was in 2011. These teams weren’t built like the Thunder or the Heat; these rosters wouldn’t have had the ability to truly compete for a ring years later. You can’t win it all with just one superstar. And that’s why James and Wade (and Bosh) teamed up. But even though this was Wade’s city and team that he had poured himself into and brought a franchise-first title to, his glory days of being “the guy” were done. When you think of the Miami Heat, who do you think of? Give it second. Get that answer ready to go…got it? Who are you thinking of? Exactly. If you are being true to yourself, you know you just thought of LeBron. Well, unless you saw where I was going and anticipated my next point…anyway, you get the idea. No longer did the guy that had already proven himself in the NBA Finals get to say it was his team. The guy that had withered on the big stage, unlike Wade, now got to claim this team as his own. And no matter what the players or coaches say, everybody out here knows there can only be one king in the valley known as South Beach. And that’s the King. But by the time they had made it back to the Finals the next year against the Thunder, Wade had found his place. He had found his place as the No. 2 guy on the team. A guy that once scored 30+ points in four straight Finals games and averaged 30+ points just a few seasons ago came to the realization that it was his time to ride shotgun so his team—LeBron’s team—had a better chance of winning the title. And they did. They won it as everybody talked about LeBron, including myself, and gave the King his crown and talked and talked and talked and talked about LeBron’s legacy. Oh how we talked. For the most part, when the national media talked about Wade, it was in the context of the Big 3. He was brought up along with LeBron and Bosh. No longer did he get a significant amount of individual attention even though he had been in Miami the longest and had the most rings of the entire roster (along with Udonis Haslem). So many professional athletes that are stars, especially in today’s NBA game, struggle to deal with age. Prime example—Allen Iverson. Sometimes it is difficult to deal with diminishing skills or a shrinking role when you’ve spent your entire career being “the guy” that I have talked about. It’s as if you’re losing a part of yourself, and you want to grasp onto this part of you for as long as possible. (Brett Favre is another example. He held on a little too long I think.) This can lead to ineffectiveness, avoidance of what your team needs from you, stubbornness and at its worst, a release or trade. Wade is certainly not to this point as he can still be this team’s No. 2 for years to come after the Heat re-sign their big stars during the summer of 2014. However, he is no longer “Flash.” He will have flashes of “Flash,” but he can no longer claim to have the ability to consistently play at such a high level with his banged up knees and wearing down body. There’s a reason he shot 17-66 (25.8 percent) from the three-point line, looks to have lost part of his shooting touch and averaged his lowest scoring amount since his rookie year. He is getting older; it’s a part of sports life. This year’s playoffs worried people. Up until Game 3 when the Heat were down to the Spurs 2-1 and talks of breaking up the big 3 had surfaced, Wade was averaging 14.2 points in the playoffs while the numbers showed that LeBron and the Heat actually played better with him off the court. But Wade found it in himself to give his team just enough flashes of “Flash” during their last four games in which they won three of them. He came up biggest during Game 7. Finally draining his pull-up jumper from the left side of the court, Wade messed up the entire Spurs’ defensive scheme. The cushion that they had been giving to Wade turned from a hindrance for the Heat to a blessing. Wade made jumper after jumper, finishing 11-for-21 from the field and allowing LeBron to again lead this team to victory and take that worldwide credit. 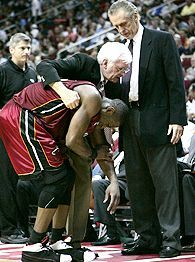 I am bringing up all of Wade’s past because we will no longer see the Wade that claimed the Heat as his team. As the injuries continue to build, we will also no longer see the Wade that could consistently be a primary source of offense every single game. This is all in the past. But it is a past filled with him stepping up, stepping to the side and stepping down at just the right times in order to make him and the only team he has ever played for three-time champions. So, the Spurs are done, right? We are going to be foolish for the nth time and simply assume that this core group of players is too old and too broken down to ever again make a run at a championship, right? They aren’t done because of one player on that team. Kawhi is he so special? Kawhi don’t I tell you. Kawhi Leonard is a 21-year-old kid that should technically be walking across San Diego State’s stage as a senior graduating from college. But due to his basketball skills and freakishly large hands, he left early in order to enter the NBA Draft. If you’ve followed Gregg Popovich since he became head coach, you’ll realize he makes an effort to keep not only his core but his team together. If you find a place and a role in Pop’s scheme, you’ll have a good chance of staying there for the long haul. Just ask Bruce Bowen. So when it was reported that Pop and his front office were trading rising star George Hill to the Indiana Pacers for the rights to their pick, many were surprised of the move. Hill was a humble guard that seemed to have the demeanor and work ethic to become a long-term San Antonio citizen. But Leonard was a player the Spurs had to have. And the 2013 NBA Finals showed America just why this was the case. Besides Duncan, this young small forward was the most consistent Spurs player throughout these grueling seven games. Over Parker. Over Ginobili. Over everyone else. Being only 6-7 in a series with multiple 7-footers, Leonard found a way to average 11.1 boards to go along with his 14.6 ppg. Leonard’s best quality can’t be found on a stats sheet. By always running the floor, diving for loose balls and incessantly pounding the defensive and offensive glass, the kid has shown he has a natural high level of energy that others can’t replicate. There’s a reason in three of the seven games in this series he had three or more steals. He has grown into one of the best defenders in the league with just the right amount of anticipation, strength and quickness. He had the job of going up against LeBron on his own for chunks of this series and did a respectable job against that freak of nature. Going to Game 7, he showed us all why he is something special. Putting in 19 points and fighting for 16 boards, Leonard finished off a fantastic series of basketball on a level of play most 21-year-olds don’t have the chance to even see. Why do you think Norris Cole, for example, got a DNP during Game 7 even though he was an effective role player during the year and most of the playoffs? Well, besides his size and inability to guard Parker, Erik Spoelstra didn’t trust his young guard during the biggest game of the year. Pop trusted his never-emoting budding star. Not only did Leonard play 45 of the 48 minutes Thursday night, he was placed in difficult situations in order to help his veteran-led team win a championship. But because of this pressure already faced by a kid that would have just been old enough to drink the championship champagne, he has matured as a basketball player far beyond his years. Once the Big 3 and Popovich all depart from this franchise (I know, I don’t believe it either…but it is inevitable), people won’t be able to have serious doubts about whether or not he can perform on any sort of “big stage” in the regular season or playoffs. He’s already done it two years into the league. Yes, he had a crucial missed free throw in their Game 6 meltdown. Yes, he missed an open three-pointer in Game 7 with under two minutes to go that would have given his team a one-point lead. But when you look at the big picture, his performance in the playoffs (14.8 points, 9.8 rebounds in their last game of their four playoff series) and his coming-out party during the NBA Finals that all took place with Duncan and Parker being the primary scorers shows there can be no doubt that the future is beaming bright for Leonard. Even though they have different games, take a look at Paul George. He played his role on Pacers teams he didn’t need to be the leader of, and when his name was called to be “the guy” last year, he became an NBA All-Star and face of the NBA’s future. Leonard also has an extreme amount of poise that will keep him from getting caught up in himself and losing himself to the fame of becoming great. He had this quality before he came into the league, and Pop has only built upon it during these two years. Leonard’s future has “star” written all over it. 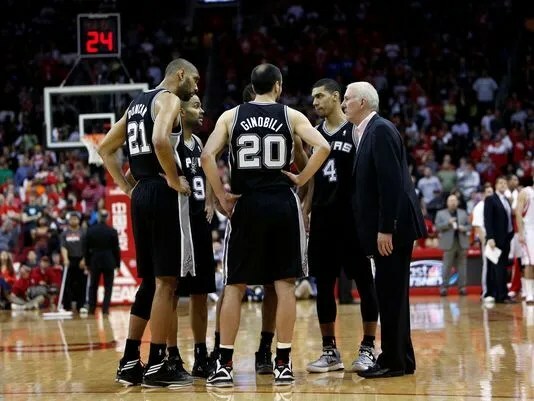 The Spurs can rest easy about what will come once Timmy, Tony, Manu and Pop call it quits. Kawhi? I think you know the answer to that. I skipped over the present because I wanted to stick to the ol’ saying, “save the best for last.” Well, LeBron is the best in the world, so I thought it was fitting. In last year’s article, I said we would see an entirely new LeBron this year that was more relaxed and enjoyed the game he has played his entire life. Other than the complaining that often took place after plays, I was right—it happened. He took an almost perfect season from last year and made it more perfect this year. During the regular season, James set career-highs field goal percentage (56.5 percent), three-point percentage (40.6 percent) and rebounds (8.0). His other numbers were right near the top of his career-highs (26.8 points, 7.3 assists). He claimed yet another MVP award and looked to be in line for making a third straight run at the championship. Then came the scrutiny. After shooting so well from all over the field during the regular season, his percentages began to drop. What went unnoticed is something very simple: this was the playoffs—a time when defenses become tougher to overcome and rotations become condensed, leading to the best players being on the floor for longer periods of time. Of course teams would find ways to cut down on LeBron’s production. But that didn’t stop this man from wrestling through these playoffs. And please don’t point out all the mistakes here and there that still shows he struggles in the clutch or in the big moment. Mistakes happen all the time. The greats are guilty as well. Look at Pop’s bad moves that cost him Game 6. In 15 years, he will still be considered one of the best coaches ever. The way you make yourself great is how you bounce back. LeBron has been in bounce-back mode since the 2011-12 season began. There are plenty of statistics that show LeBron plays at his best when his back is against the wall. I’m going to only focus on two things. Two Game 7s. During Game 7 of the 2013 Eastern Conference finals and NBA Finals, LeBron averaged 34.5 points, 10 rebounds and shot 95.9 percent (23-of-24) from the free throw line. During a game when he tied the record for most points in an NBA Finals Game 7 win (37 points), he shut down the notion that he can’t shoot by making five three-pointers, shots that were given to him by the Spurs’ defense all series long. And fitting in perfectly with this misconception that he doesn’t have a jump shot, LeBron drained a pull-up jumper to extend the Heat’s lead from two to four in the final minute of their closeout win. He overcame his own mental handicap with his jump shot, one of the biggest obstacles he has ever faced, and took this championship. I have never seen, “doing what needs to be done to win” exemplified in NBA basketball better than with LeBron James during these past few months. Even though this often gave him unwarranted and probably unwanted criticism since he sometimes worked to get his teammates going rather than himself first, he doesn’t care. Well, I’m sure his two championship rings are enough of a comeback. Whether it’s changing teams, changing the way he plays or changing the game of basketball for the NBA, James has done what he needs to do in order to win. And you have to give him credit for doing that and becoming the third player ever to win MVP and the NBA title in consecutive seasons (Bill Russell, Michael Jordan). I asked you earlier what player you thought of when I brought up the Miami Heat. Well, when you think of the NBA, who comes to mind? I’ll give you a second again…got it? And don’t think for one second the present will be changing anytime soon. 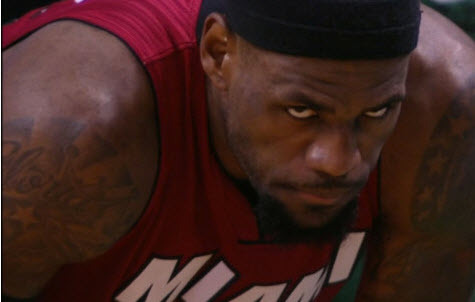 This is LeBron’s time. The future will just have to wait. Just as all the greats can do, she has the ability to go into a different zone. She goes into a place where she can’t be stopped. She doesn’t see “losing” as a reasonable outcome. Williams showed the French what it means to be a force of nature. Serena Williams won her second career French Open title by taking down Maria Sharapova 6-4, 6-4 on Saturday. Just as Serena saved her fastest serve of the day—123 mph—for the last serve of the day when she claimed her 16th Grand Slam, the oldest ever #1 ranked female tennis player in the world seems to save her best tennis for the biggest of stages. As much as the sports media loves to analyze the reasoning behind one player/team winning a championship over another player/team losing a championship, it can’t be done with this match. Sharapova played some great tennis and stuck with Serena throughout the entire match…but it didn’t matter. It didn’t matter because Serena is on her own level of tennis that can’t be touched by any other woman playing the game. Sharapova is deservingly ranked No. 2 in the world and was the field’s best chance of taking down Serena. She might have played great tennis but Serena played flawless tennis. At 31, Serena is sports-old. It would seem with the amount of pressure she puts on her body with her rough style of play, Serena would be on the decline, especially since she went through a plethora of injuries in 2011—including a life-threatening one—that kept her from winning a Grand Slam for that year for the first time since she went major-less in 2006. But looking at Serena cruise through this French Open as she only lost one set the entire tournament, this tennis player is as dynamic and fit as she’s ever been. She no longer tends to sit back and pound the ball down her opponent’s throat while moving as little as possible. She’s chasing balls. She’s covering the baseline. She’s playing solid defense. She has become more active while still maintaining the strongest pair of arms in the game. By far. Only one Grand Slam away from matching Roger Federer‘s 17 titles. It means Serena Williams is like the San Antonio Spurs. Reader: Wait wait wait…you’re comparing a tennis player to an NBA franchise? You’re stretching things, Jay. Since the beginning of this millennium, San Antonio has won three championships (2003, 2005, 2007) and is currently up 1-0 in the NBA Finals. This team should be considered a dynasty, even though you must stretch the definition a bit. Due to the fact that the Spurs’ big four—Tony Parker, Manu Ginobili, Tim Duncan and Gregg Poppovich—have won their championships over such a long period of time unlike other sports dynasties that gathered championship trophies all at once, they don’t necessarily define a certain period. You can’t say they define the 2000’s era of basketball when five other teams have taken home the title. However, they persevered through an ever-changing league when it is an anomaly to keep hold of a core group of players. They persisted time and time again when they were proclaimed by experts as being too old and were advised to break up their core. They won three titles in a methodical manner with the same three players and head coach being the foundation to their success. And now, these four men are on the verge of adding one more banner to their stadium—winning their first one exactly 10 years ago. Serena has persevered through the same level of change and scrutiny. Since 2006, five men have won a major and two of them only won it once. During that same time period, 13 women have won a Grand Slam, including 2011 when four different women—none being Serena—won the four majors. Obviously, these numbers make it seem as though no one woman has been able to take command of the game—how else can you explain Kuznetsova winning a Grand Slam in 2009? I mean, really? Things eventually hit rock bottom for Serena in her own country in 2011 followed by two early exits in her next two Grand Slams in 2012. It seemed it might be time to start reflecting on her career and how impressive she had been. But just like the Spurs, right when you think Serena is done being a force, she decides to prove you wrong. Winning three of the past four majors, Serena is right back atop of the women’s tennis world and doesn’t look to be coming down any time soon. San Antonio is up one game on the favored Miami Heat and is only three wins away from being atop the NBA world yet again. Both are more than dominant—they are resolute. When everything around them is changing and they are being talked about in the past tense, they continue to do the only thing they know how to do: win. There may be hard-to-swallow first round exits along the way (Spurs lost to the 8th-seeded Grizzlies in the 1st round of the 2011 Playoffs and Serena lost to 111th-ranked Virginie Razzano in the 2012 French Open), but that doesn’t deter these steadfast champions from continuing their course of superiority and success. They continue forward. I have no doubt Serena will continue winning Grand Slams—at least one more this year. There’s no one standing in her way as she took down her toughest competition in straight sets Saturday. San Antonio has the right coach, game plan and original “Big 3” to take home another championship in the next few weeks. Could they win another one after that? It would be tough, especially in a league with Kevin Durant and LeBron James only getting better. But before you say they’re too old and that this will be their last chance at a ring, remember the 2013 French Open women’s champion. Remember that some dynasties last longer than you think. Some dynasties like Serena and the Spurs. In case you missed, here is Tony Parker hitting a buzzer-beater in their home-opener to not only take down the reigning Western Conference Champions but also remind the NBA that this team with 13 returning players from last season will without question be a contender yet again.